The best Stockholm hostels have a reputation for innovative design. Not only do each of them have their own richly intriguing history, they will also save you a fortune whether you are only staying for a weekend or a week. So, I will take you through some of the best and quirkiest Stockholm hostels and will also share brief histories behind what makes them stand out above the rest. This is undoubtedly a tourist favourite while visiting the city. You can wake up on the water to breathtaking views of Stockholm. It’s a classic old boat that has been anchored at Skeppsholm since 1937. The ship is over 100 years old but it still boasts its charm and this is often overlooked as you walk down its dark corridors with low ceilings. Skeppsholmen is a lovely little island with calm surroundings in the center of Stockholm. Af Chapman boasts over 136 beds, although if sleeping on the water isn’t what you are after but you like the sound of the views, the 19th century building right next to the quay is probably the place for you, with further rooms available in here along with a 24-hour reception. In the building, there is also a breakfast service, self-catering, a small shop, laundry room and extra luggage space. This is a personal favourite. At this youth hostel, you will stay in an original renovated prison cell of the Crown Remand Prison (Kronohäktet.) Kronohäktet was built in the 1840’s but was closed in 1975. You stay in 2-4 bed cells that are a whole lot more comfortable than they were in the 1800’s, but don’t fear; you will have your own key! The prison buildings were falling into decay only a short while ago and a lot of hard work ensured. The main core of the building remained. In 1989, the hostel was re-opened after its redevelopment. You can visit the prison museum which gives a fascinating look into what life was like for prisoners at this famous establishment before it become one of the quirkiest Stockholm hostels. Outside the entrance, there is a cool bathing beach with good jogging and walking trails in a peaceful and gorgeous park environment. On the other side of the bridge, you will find Södermalm which is one of the most beautiful areas of Stockholm with an abundance of swanky bars and delicious restaurants. As you can probably guess by the name, this is your chance of spend the night aboard a real jumbo jet- on the ground and without those uncomfortable airplane seats! You can choose between living in fresh rooms with showers and toilets or in a converted cockpit with a panoramic view of Stockholm’s Arlanda airport. 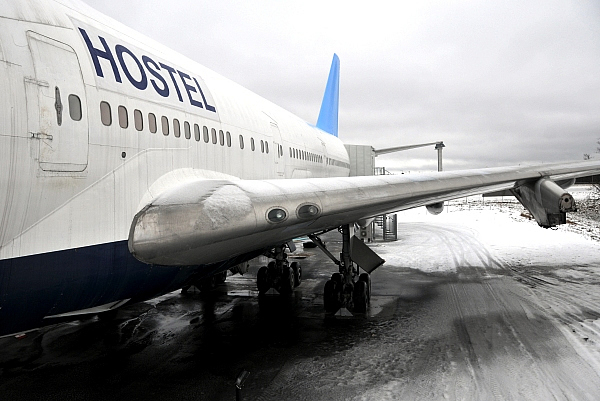 This Boeing 747 was manufactured in 1976 and was given the name “Life”. It was commissioned in December 2007 and moved onto the tarmac at the airport fully revamped for guests in August of the following year. This unusual and totally unique hostel has 33 rooms with over 75 beds, but the best of the lot, as mentioned previously is the cockpit suite- which is well worth a visit just to experience this. You can read our interview and review of this amazing hostel here.